This layout measures 41ft 9in x 14ft 6in, made up of 22, 6ft by 3ft or 2ft 6ins boards made from 12mm exterior ply on 75mm x 25mm battening with occasional variations as can be seen in the canal area. It is designed to be free standing, so that the viewing public can view on all four sides, the operators all work in the middle. This fictitious layout is based in the South Yorkshire/North Midland area between 1957/ 1962, allowing us to run both steam and early diesels from the BR Midlands period with visiting stock from the Eastern and Western regions. Built to 00 Gauge 4mm scale it is powered by Analog DC and is controlled by nine operators using six control panels and twelve controllers. To operate this at an exhibition we like to travel with a team of fourteen, this gives operators a rest every once in a while. It can be quite stressful operating to the high standard required! Train movements are to a schedule, for passenger and fast freight. The goods yard and slow freight work independently. Stock is owned by club members and is a mixture of kit built and RTR. Fitting crew and lamps to the locos and real coal in the tenders is on going. All express passenger trains are close coupled. We are also in the process of weathering the stock. The operating signals are a mixture of semaphore and two aspect coloured light. All track work is Peco code 100. As can be seen there has been a conscious effort to provide a large variety of scenery and a tremendous amount of quality scratch building. Many club members past and present have put this together over a 9 year period. DoreHill station has five through platforms- three north and two south – with a single bay northbound and a goods avoiding line running south. All passenger trains stop here. All the station buildings and platform canopies are scratch built. Colour light signals control the station. The Departure Announcement display board at DoreHill Station is operated by a computer, controlled by the two operators. This whole ensemble was devised, built and programmed by one of our more gifted members. Let’s take a journey around the layout. Trains leaving Dorehill Station northbound pass the parcel/goods shed and MPD yard. Passing the signal box, trains going to Nottingham go left, northbound we continue into the triangle area. Here the scenic guys have had a field day. This large area gave them the opportunity to vary the ground levels, down as well as up. A canal basin was developed below a viaduct, and another viaduct was built into the side of the embankment. The adjacent buildings are all scratchbuilt. In the club house this layout only just fits in, so nobody can get round the outside. When the layout attended its first show at our exhibition in 2009 this was the first time that many of us had seen this area and we were completely blown away. Moving on the line is joined by trains coming from Derby and has slow lines for goods trains. We now approach Newboldon Junction; it has four platforms and is on a large curve. Most trains stop here. Shops in the surrounding area were again scratchbuilt as were the footbridges. Due to lack of time all the terraced houses and some of the shops are modified Skaledale. On leaving Newboldon trains for Derby go left and here we also lose the slow lines which go to the goods yard. Trains going straight on come to a long straight complete with water troughs and then approach a small two platform station Roe End. Normally only suburban services stop here. As we leave Roe End we are joined by the line from the goods yard and enter Tetley Tunnel a large tunnel complete with ventilation shaft. Exiting the tunnel the line is joined by trains coming from Birmingham and enters Dorehill station from the south end. The main fiddle yard is in the middle of the layout and is the centre of all operations. It can send out trains in four directions. The two operators are the busiest on the layout. Passenger trains are sent out to a schedule, these guys must get it right or other operators could find they are receiving express trains instead of a DMU! If you would like to exhibit Dorehill St. Stevens at your show, please contact Barry Lock on 01530 450187 or soarvalleymrc@gmail.com. Sowters Lane is a fictitious “OO9” narrow gauge junction layout, situated in a rural location and is based loosely on a number of slate, coal and quarry railways. Trains converge from the three quarries and mines and thence via the junction at Sowters Lane to the Main line transfer yard off scene. In addition to the quarry and mining traffic the occasional passenger and goods freight trains can be seen meandering through the scenic countryside, where the keen eyed will spot the Blacksmith welding in his works and the Farrier working on his horse shoes. The local bus awaits passengers to be taken to the nearby town, the taxi awaits fares and the postman makes his rounds delivering letters. This layout was initially built by the late Steve Forrester. It has since been extended twice with two fiddle yards one at either end. All the track, points and point motors are PECO. The buildings are scratch built. This is a favourite layout of mine. Plans are afoot to convert it into a junction with extra fiddle yard sidings with independent control, to provide additional interest and train workings. The storage sidings to the far right are also to be controlled independently to carry out shunting the quarry and mining material for onward movement to the main railway connection nearby for country wide distribution. This operation to be carried out to fill in gaps between Scheduled train movements. For exhibition purposes, the layout is approximately 16ft in length and 6ft in depth. It requires 1 x 13amp power point. The existing layout as photographed provides plenty of interest for either two or three operators. In addition to passenger services, the occasional freight, local quarry and mining trains can be noted winding their way through the scenic countryside. If you would like to exhibit Sowters Lane at your show, please contact soarvalleymrc@gmail.com. This layout is based on a Southern Region branch line terminus around the Ashford area in the British Railways era 1950s & 1960s. Traffic is mainly a push-pull branch line service with additional hop picker specials all mingling with a regular freight service to and from the main line. If you would like to exhibit Aylett End at your show, please contact soarvalleymrc@gmail.com. Our interactive layout for children. 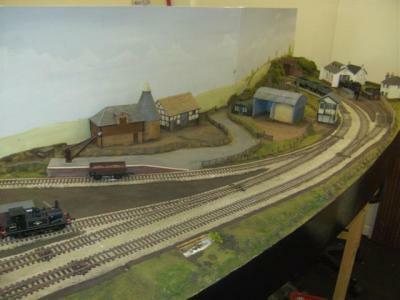 Volunteers from the club regularly exhibit the layout to help raise money for Rainbows Childrens Hospice. Our new 'O' gauge layout started with the original idea showcasing the Charnwood Forest Line Loughborough Derby Road Station which led out to a viaduct in a straight up and down configuration. After a lot of thought and with the hope of doing something different we decided that although the LMNW line closed to passenger traffic in 1931 we tried to envisaged what it would have been like in the late 1950s early 1960s if the line had remained opened. Our original idea was developed and with much discussion it was decided that the layout should increase in size and that it would contain 4 major view points, a) Loughborough Derby Road Station would remain but would now include a goods shed, turn table and M.P.D. b) Whitwick Station would now be included with an additional platform to allow passing passenger trains ( this was included for running and interest purposes). c) a goods yard with the appropriate goods shed and finally, d) Grace Dieu Viaduct with its intricate stone and brick work leading through a bridge into the fiddle yard. The layout is still under construction with the emphasis on buildings and the country side around these areas at the time rather than from an industrial viewpoint. All the buildings up to this stage have been hand built in cardboard whilst the Grace Dieu Viaduct has been constructed with individual bricks made of model clay. If you would like to exhibit The Charnwood Forest Railway at your show, please contact soarvalleymrc@gmail.com. Meridian Parkway(OO) - A modern image DCC layout. All Boards made,Trackwork laid, Electrics almost complete,Scenery in progress. added in the central area of the layout ,scenery in progress. Lossiemouth (oo) - A representation of the Great North of Scotland station set during late 50's early 60's. Boards assembled, Some track down. DILHORNE COLLIERY (OO) - Well it's a colliery layout, with coal and some trains. More to follow !